Bad tire management and further development of the Rampante Cavallino, possible reasons that justify the higher performance of the SF90 compared to the W10. For the first time in the hybrid era, Mercedes will not reach the first race of the season as the main favorite to victory, despite presenting a completely renewed car in aerodynamics in the second week of preseason. A situation, that surely, it will have led to the lighting of some alarms in Brackley and Brixworth, if we take as a reference the prediction of Lewis Hamilton: "Ferrari is by far the fastest, I think it is more or less half a second, potentially" , affirmed the five-time champion on the last day of the test at the Circuit Barcelona Cataluña. But, what are the possible reasons that explain the Ferrari sorpasso? In the presentation of the W10 in the Silverstone layout, James Allison admitted that this winter the engineers of the silver arrows had worked intensely in the suspension and aerodynamics to create a less demanding car with tires. A mishap that has affected the performance of the single-seater in the last three years and that has returned to reproduce in the tests. In the different batches that Hamilton and Valtteri Bottas have completed at the Montmeló circuit, it has been possible to observe the phenomenon of graining present in the Pirelli (temperature difference between the asphalt and the tire which causes small parts of the rubber to remain stuck the compound generating a loss of grip) . "Roscoe tried to bite him but he found it too difficult, I do not have many good things to say about the tires, the new nomenclature is very confusing, but we'll get used to it. the tires were not bad, in fact, the ones used in Silverstone and France were really good The easiest thing they could have done is to bring those this season, but they have not done it ", censored the pilot of Stevenage. 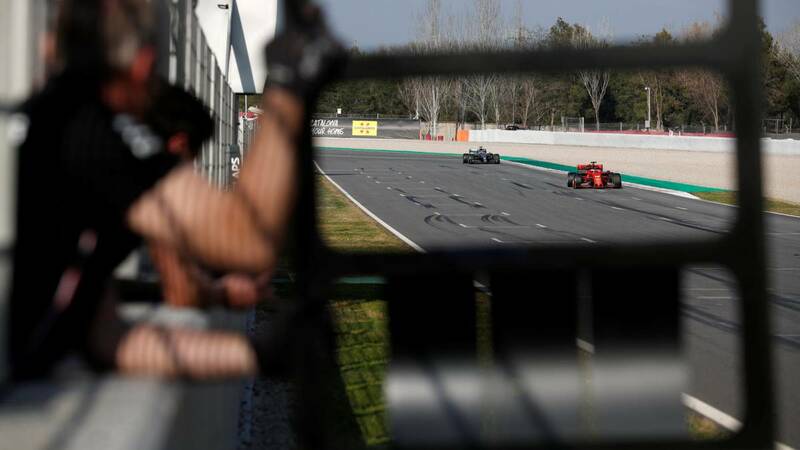 An analysis that also shared Bottas, although the pilot of Nastola prefers to wait for the first tests to verify if t rat of an inconvenience that requires a lot of attention from the technicians: "There is a very small window for the tires to work. It is too much to say that the car has 'diva' qualities like the previous ones. Step by Step. We will see how it behaves under the right conditions. I really feel that there are areas in which the car has made good strides forward, in the low-speed corners it feels better than last year, but in other areas there is still work to be done. " "Obviously during the year you have to a large group of people who work for the championships. If it looks like you're not going to win the World Cup, no worries will get you away from a certain part of the team before, so Ferrari probably started developing its car at least a month before us. We, meanwhile, were pushing to win the title and obviously we got it, "said Lewis Hamilton. A vigorous development race where any minimum advantage can be decisive seeing the precedents, although the Briton chooses not to be excessively worried or disappointed by this scenario:" It's different when you're a persecutor and Not a defense. Last year they came here with a car that worked well, but now they are even better. Okay, we are not worried about the challenge, the fight. It means that we have to work harder, but in reality I am very proud of what my team has done to put us in the position we are in today. I am not worried, disappointed, or anything. We have a mountain to climb, but we know how to do it ". Diez días. This is the interval that remains for the stoplight on the Albert Park pit road to turn green and start the first free practice session of the Grand Prix of Australia 2019. We will see if the mountain is steep or flat for Mercedes.